It was originally based upon a three-part serial story written by Jack Finney that appeared in Colliers Magazine in late 1954, and then in 1955 was rendered into an expanded novel, The Body Snatchers. The screenplay, written by Daniel Mainwaring (who also wrote the script for the classic noir Out of the Past (1947)) was aided, according to some sources, with uncredited scriptwriting and dialogue direction by Sam Peckinpah (the great Western director who appears in a bit cameo part as a meter reader). A quintessential, black and white B-picture, it was precisely-executed and packed with action by director Don Siegel, plus a scary musical score from Carmen Dragon. The subtle, low-budget film (at about $420,000) is very effective in eliciting horror with slow-building tension, even though there are no monsters (just indestructible plant-like pods), minimal special effects, no violence in the take-over of humans, and no deaths. The film had a few preliminary titles: Sleep No More, Better Off Dead, and They Came From Another World before the final choice was made. The theme of the cautionary, politicized film was open to varying interpretations, including paranoia toward the spread of a harmful ideology such as socialistic Communism, or the sweeping mass hysteria of McCarthyism in the 1950s and blacklisting of Hollywood, the spread of an unknown malignancy or virulent germ (read fear of annihilation by 'nuclear war'), or the numbing of our individuality and emotional psyches through conformity and group-think. Yet its main theme was the alien (read 'Communist') dehumanization and take-over of an entire community by large seed pods (found in basements, automobile trunks, a greenhouse, and on a pool table) that replicated and replaced human beings. And it told of the heroic struggle of one helpless but determined man of conscience, a small-town doctor (McCarthy), to vainly combat and quell the deadly, indestructible threat. Don Siegel An allegory for Communism and McCarthyism; the traits of being "one of them" is being cold, unable to express emotion or closeness. This original film would become more and more revered and distinctive as time passed; with an added prologue and epilogue by the studio. Invasion of the Body Snatchers (1978) Philip Kaufman An allegory for the psychological revolution of the 1970's and self-help books; the traits of being "one of them" is secretive groupthink, being too close and intimate; the end of the 60's and the foreshadowing of the 80's; with Donald Sutherland and Brooke Adams (and featuring cameo roles by Kevin McCarthy as a man running on the freeway now warning "they're here" rather than "you're next," and Don Siegel as a cabdriver) and set in San Francisco and nearby Mill Valley, with the tagline: "You'll never close your eyes again"; critic Pauline Kael of The New Yorker commented: "It may be the best movie of its kind ever made. For undiluted pleasure and excitement, it is, I think, the American movie of the year." Body Snatchers (1993) Abel Ferrara With the original title of Jack Finney's; the alien attack is no longer a psychological allegory; it now resembles a foreign, terrorist siege that takes place on a Southern military Army base; with Gabrielle Anwar, Meg Tilly and Forest Whitaker. The Invasion (2007) Oliver Hirschbiegel An updated adaptation of the Jack Finney story in which the invading aliens are a flu-like virus brought to Earth by a crashed space shuttle, turning its victims into cold, emotionless persons after they sleep. The film stars Nicole Kidman as Washington DC psychiatrist Carol Bennell, whose son is inexplicably immune to the virus, and Daniel Craig as her co-worker Ben Driscoll. This relentlessly haunting film received no Academy Award nominations. It was originally released at 80 minutes, and then reissued at 76 minutes in 1979. The prologue and its unconvincing matching epilogue were not in the original shooting of the film and were later tacked on. (The studio-imposed footage was removed in the 1979 re-issue.) Allied Artists wanted to soften the paranoia of the original and provide a more hopeful ending with the framing device. Executives at the studio also forced Wanger to release the film in SuperScope - an anamorphic widescreen process that altered the original 1.33:1 ratio that the cinematographer had used. 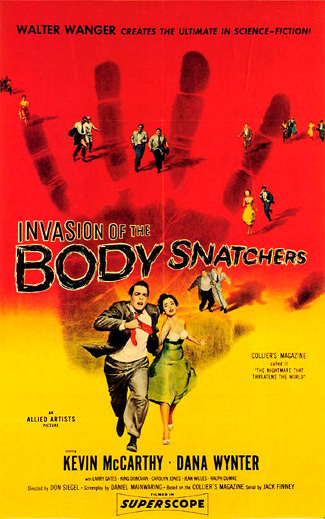 Director Joe Dante, an ardent aficionado of 1950's science fiction and monster films would, among other genre films, reference Invasion of the Body Snatchers frequently. He re-used Kevin McCarthy in a number of film cameos: The Howling (1981), Twilight Zone: The Movie (1983), Innerspace (1987), the comedy spoof Matinee (1993), and including an appearance reprising his Dr. Bennell character in Looney Tunes: Back in Action (2003), now elderly, clutching a seed pod and still muttering that everyone was next. Dante often included the seed pods in his films as well -- Dr. Catheter (Christopher Lee) clutches one in Dante's manic parody Gremlins II: The New Batch (1990). Doctor, will you tell these fools I'm not crazy? Make them listen to me before it's too late. General practitioner Dr. Miles Bennell explains, in a series of flashbacks from a few days earlier, the terrifying take-over of the town of Santa Mira, California. Well, it started - for me, it started - last Thursday, in response to an urgent message from my nurse. I'd hurried home from a medical convention I'd been attending. At first glance, everything looked the same. It wasn't. Something evil had taken possession of the town. But strangely, only a few of Miles' patients appeared for their appointments, while many were cancelled. He hears examples of alienation from a few sources - each example includes suspicions that relatives have changed their identities or don't seem to be themselves. One is provided when Miles is visited by his intelligent ex-girlfriend/sweetheart-fiancee, now recently divorced, Becky Driscoll (Dana Wynter). Becky tells him that her middle-aged cousin Wilma Lentz (Virginia Christine) is suffering from strange delusions that her favorite Uncle Ira is an imposter and has been replaced. When he discovers that, like himself, she is recently divorced, he kids: "Well, I guess that makes us lodge brothers now...except that I'm paying dues while you collect them." Sick people who couldn't wait to see me, then suddenly were perfectly all right. A boy who said his mother wasn't his mother. A woman who said her uncle wasn't her uncle. Dr. Kaufman: A strange neurosis, evidently contagious, an epidemic mass hysteria. In two weeks, it spread all over town. Dr. Kaufman: Worry about what's going on in the world probably. Miles (jokingly hoping they won't catch it, with the prophetic statement): I'd hate to wake up some morning and find out that you weren't you. Their intimate dinner in the nearly empty restaurant is immediately interrupted by a call from intellectual friend Jack Belicec (King Donovan) who asks them to come over. He shows them a strange, corpse-like cadaver lying on his pool table - with an unfinished, half-formed, mannequin-like humanoid face and no fingerprints: "It's like the first impression that's stamped on a coin. It isn't finished." Awed, Miles guesses that the mysterious corpse approximates the size of Jack himself, "five ten...maybe 140 pounds." His description of a similarly-sized body startles Jack, causing him to drop a bottle and cut his hand. On a premonition that Becky is also in danger, Miles races to Becky's house, enters through a basement window, and in the darkness discovers a smooth-faced, replica "double" for Becky hidden in a bin - and obviously placed there by her father. Frightened, Miles wakes her from a drugged sleep state and carries her away to his house. By this time, Dr. Kaufman has been notified of the weird happenings, but he is skeptical and ridicules their fears, especially when the corpses disappear. He again explains everything away as mass delusion and hysteria. Driving home, I had a lot of questions and no answers. How could Jimmy and Wilma seem so normal now. Surely I had done nothing to cure them. Maybe they wanted me to feel secure but why? At a barbecue at Miles' home in the famous greenhouse scene, with friends Jack and Theodora, they discover two giant seed pods that burst and explode open like rotten cabbages, with a milky fluid bubbling out [a mock birth scene]. In the terrifying scene, the disgorged pods reveal grotesquely duplicate similarities to their human counterparts - replicas covered with a sticky, sappy foam. Miles, who realizes that one of the 'blanks' looks like him, searches for lighter fluid, and then takes a pitchfork and stabs at the pods' hearts in a vampire-like killing. In my practice, I've seen how people have allowed their humanity to drain away. Only it happened slowly instead of all at once. They didn't seem to mind...All of us - a little bit - we harden our hearts, grow callous. Only when we have to fight to stay human do we realize how precious it is to us, how dear.